Dispenses 350 C-fold, 475 multi-fold paper towels. 3.0 gal. 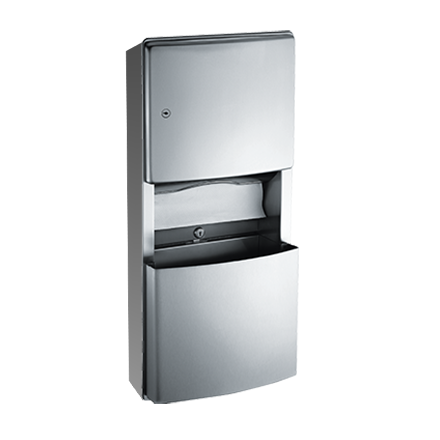 (11.2 L) removable stainless steel waste receptacle with a tumbler lock. 22 gauge type 304 stainless steel door in a satin finish with a flush lock and a heavy-duty 3⁄16″ staked piano hinge on door. Towels are self-feeding upon user manual demand until supply is depleted. Unit may be reloaded with a partial load in place and will continue to feed properly. Towels are replenished and waste receptacle is emptied manually. Locked door and waste receptacle prevents unauthorized access or removal.